Whew! Everyone could certainly use some relief from the anxiety and stress of the past two weeks. The Barnacle State Parkâ€™s outdoor pavilion sustained serious damage from Hurricane Irma and will be out of commission for some time. Because many of our Dade dancers are still recovering from the storm, with another storm possible next weekend, we will put our Sunday afternoon Old Time Dances on hold for September and October, and evaluate the situation again in November. The Park has offered us use of the porch or office parking lot. In addition we have the upstairs room at John Martin’s Irish Pub and Restaurant, 253 Miracle Mile, Coral Gables, as an alternate site if the Park pavilion remains unavailable. Look for emails on dances at either Park or the Pub for November and beyond. If you have alternate sites, please contact us. 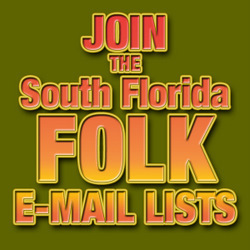 The Boca dance has a core group of volunteers that take turns with running monthly dances.. Help us keep the wonderful tradition of American group folk dancing alive in Miami! We need to connect on something besides the internet.